Reve Seating Gives You A New Reason To Daydream. The Contours Of The Chair Provide Lumbar Support While The Perforated Back Gives It Breathability, Ensuring Uninterrupted Comfort. Ganging Connector Glides On The Silver Sled Base Allow You To Use Multiple Chairs To Set Up An Integrated Welcome Area. They Are Also A Great Addition To Multipurpose Areas, Easily Stacking Away When The Day Is Done Or When The Next Meeting Comes Along. 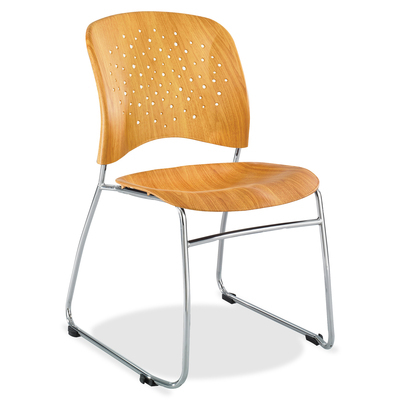 Chairs Store Easily And Stack Up To 12 High And 18 High On A Chair Cart (Sold Separately). Rounded Back And Sculpted Seat Are Made Of Plastic Though They Look Like Wood. Weight Capacity Is 250 Lb..
Reve Seating Gives You A New Reason To Daydream. The Contours Of The Chair Provide Lumbar Support While The Perforated Back Gives It Breathability, Ensuring Uninterrupted Comfort. Ganging Connector Glides On The Silver Sled Base Allow You To Use Multiple Chairs To Set Up An Integrated Welcome Area. They Are Also A Great Addition To Multipurpose Areas, Easily Stacking Away When The Day Is Done Or When The Next Meeting Comes Along. Chairs Store Easily And Stack Up To 12 High And 18 High On A Chair Cart (Sold Separately). Rounded Back And Sculpted Seat Are Made Of Plastic Though They Look Like Wood. Weight Capacity Is 250 Lb.